Today we have a Core Focused, Cardio Burn workout on our agenda. This is a great routine for burning fat, and building core strength and stamina. Be sure to keep your core strong and engaged during each exercise. This will help recruit your transverse abdominals, which work like a girdle to support your middle and back. As you can see in the photo below, all of the abdominal muscles work to control different movements. This is why you need to utilize a variety of exercises and motions to work your entire core. 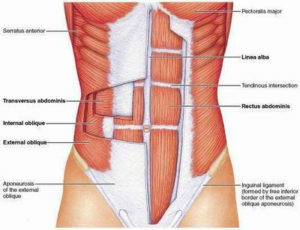 The transverse abdominals are the deepest layer of core muscles. Today’s routine will use your muscles in each plane of motion. If you find a specific exercise difficult, don’t worry. Get in as many reps as you can. You will build strength and endurance over time. I planned on filming a new workout today, but we had a surprise visit from some friends that we haven’t seen in over a year. I will be filming a new workout early this week, and will get it posted as soon as possible. I will also post a sneak peek move on my Instagram account, so be sure to check it out. Taking advantage of the warmer temperatures to spend some time outside. I did get in a short walk today with my son. We spent some time outdoors, because the weather was nice, which is not common for our area in January. 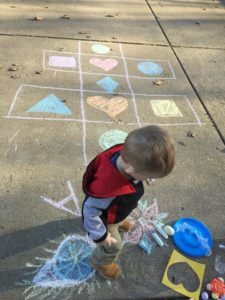 I love coming up with fun learning games to play with my son. This time we practiced shapes, and jumped up and down on each shape. We also worked on colors, and got in some fine motor play using our sidewalk chalk. We both loved having some fun in the sun. I hope you enjoy today’s exercise routine! Let me know how you like it! I will update everyone as soon as I film the newest workout routine. Set your timer for 10 Rounds of 40/50. Optional: Pair with 15-30 Minute Run or Cardio of Choice. I liked it! Short but intense. Gives me time me to do a run. Thank you! I love, love your workouts. They are interesting and get the job done!